With Las Vegas the 30th largest city in the United States, having a population of 604,000, it has many opportunities for continuing education in online marketing. As part of our continuing education directory of SEO (Search Engine Optimization), social media marketing, and marketing (generally) opportunities for adult learners, here are our selections for continuing education in marketing in the Las Vegas area. Please note that we can provide corporate training on these topics by custom quote (minimum of 5 participants). Free Directory. Use this free directory of Las Vegas continuing education programs in marketing to find possible SEO, Social Media Marketing, and/or AdWords training classes. Be advised that all programs and schedules are subject to change without notice; the JM Internet Group assumes no responsibility for listings in this free directory. Small business owners and marketers, entrepreneurs starting their own businesses, and even non-profits can (and should) avail themselves of free Internet marketing opportunities ranging from Google / Bing optimization to Facebook or Twitter marketing to simple tactics to use “real world” marketing to improve their performance. We at the JM Internet Group are all about learning and doing… If you know of a continuing education opportunity in the Las Vegas area, please contact us for free inclusion (non-profit organizations, only)! Continuing Education In (Internet) Marketing: Las Vegas. Make Money with Your Computer – Learn about, and how to implement, computer-based business ideas that earn from $15 to more than $75 an hour. Promote Your Business Using Blogs and Social Media – Find new customers and freelance opportunities through Facebook, Twitter and other social media outlets. Get Paid to Shop and Run Errands – Learn how to shop for money by establishing a profitable personal shopping or errand business. Las Vegas Adult Education Classes offers a wide range of computer based training. Desert Rose Adult High School has various courses in computers and technology, together with Business Software and Apps. Among marketing associations in Las Vegas, there are many. Most have events that will help you learn online marketing, ranging from search engine optimization to Facebook marketing. For example: American Marketing Assocation, Las Vegas, and Las Vegas Interactive Marketing Association. Las Vegas is some 525 miles from our location in San Jose, California. With plane fares estimated at $200 round-trip, plus workshop time of 8 hours and 1/2 hour of preparation time for each hour of instruction… assuming you have a group of at least 5 persons, an in-person, private workshop training in SEO / Social Media / and/or AdWords would run roughly $800 plus expenses. So your options are to either use the continuing education resources listed above (be sure to check their course catalogs for course offerings, as these vary over time), to use online training, or to contact us for a private workshop. We also provide one-on-one training online. Here are some fun facts about Las Vegas. 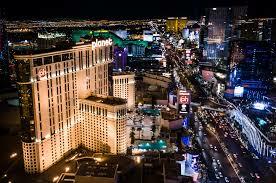 It would take you 288 years to spend a night in every hotel room in Las Vegas. Prostitution in Las Vegas is actually not legal, despite what everyone believes. At the notorious Heart Attack Grill, one man actually did suffer a heart attack! One third of cheating and thefts in Las Vegas casinos are carried out by the staff. Howard Hughes stayed longer than planned when he booked the top two floors of the Desert Inn, and was asked by the then owner to leave: instead, he bought the hotel for $13 million. There is a “black book” in Las Vegas which has the names of people who are banned from every casino in the city. This one’s odd: just outside Las Vegas is Boulder City: it’s one of the only two cities in Nevada to ban gambling!